Heat olive oil in heavy 6-qt. saucepan over medium heat. Add onion and cook until golden, stirring frequently, about 5 minutes. Add carrot, leek and fennel and cook 3 minutes, stirring frequently. Add thyme, bay leaves and whole garlic. Season with salt and pepper. Add 2 cups stock and wine and bring to a boil. Reduce heat to a very gentle simmer and cook for 2 minutes. Meanwhile, pat salmon dry. Season with salt and pepper. Lower into liquid. Add enough of remaining stock if necessary to cover salmon. Add olives, herbs and chopped garlic and simmer until salmon is almost opaque, about 4 minutes. Transfer salmon to shallow soup bowls. Cover and keep warm. Add tomato and bring to a light boil. Stir to blend. Adjust seasoning if necessary. Remove thyme, bay leaves and whole garlic. 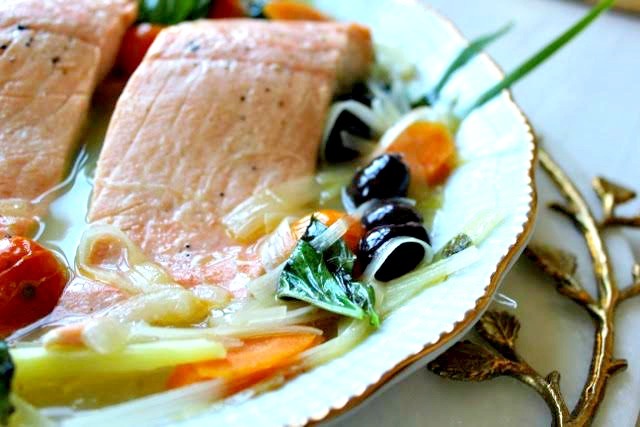 Spoon broth and vegetables over salmon. Serve hot or warm.